actually I’ve always thought the slide technique as different from a front-back motion, thanks for this lesson. You’re welcome. Thanks for your comment. I disagree. The slide COMES from a front/back motion. Just my opinion. I already use heels-down when playing double strokes, but I’m trying to develop the movements I’m using when playing doubles into something where the motion involved with the toes, ball of the foot, ankle, knee, and thigh is much like that of double-strokes played with the hands, but without the Moeller-esque swivel movement, which, while at the time being don’t quite agree with it (which is probably because I’m not sure how to get my foot to work that way), I can see myself using it more for triplets and quadruplets, where I’m guessing the twitch muscles of the muscles in just the ankles and toes would seem to start to not be quite enough to fulfill the speed and fluidity of movement needed for larger, tighter groups of notes. Interesting article. 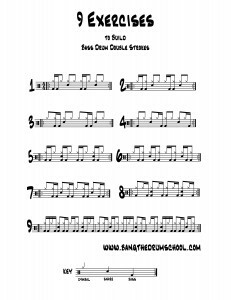 I am familiar with this bass drum technique I remember first trying it years ago and found it somewhat awkward at first but with time it becomes more fluid and useful. As always it just takes practice to make it work. Thanks. You’re welcome, Mark. Thanks for reading. Thanks Mark !! Just downloaded these . Thanks for all you do to help everyone in their drumming adventure . I have lot to work on . You’re welcome. I’m so glad that you’re finding this stuff helpful.